Become A More Effective Leader in 2010! Here is an easy-to-understand infographic to help you utilize your human capital. Get inspired by the latest EDSI videocasts! You may be familiar with the term Emotional Intelligence, but many of us are vague as to what it really means and why it is important. Emotional Intelligence refers to the array of personal-management and social skills that allows one to succeed in the workplace and life in general. EQ encompasses intuition, character, integrity, and motivation. It also includes good communication and relationship skills. We typically want to keep emotions out of the workplace entirely, right? Wrong. There simply isn’t any way to keep emotional intelligence separate from decision-making, leadership, and success in life. We all have experiences of intuition that have given us the insight we needed to solve a complex work situation. That is your emotional intelligence at work, giving you the added tools you need to navigate your world more successfully. Of course, the real pay-off comes from a healthy dose of rational, factual thinking mixed with the valuable qualities of emotional intelligence. Recent studies show that IQ, or general intelligence accounts for no more than 25% to one’s overall success. Depending on your field, strong technical competency is critical. Regardless, most experts maintain that it contributes only 12-20% to success. So what makes up the remainder of the success formula? Case studies and longitudinal studies give us a clue: opportunity or luck add a few percentage points, but most well respected leaders create their own opportunities. Why is that? Because they rank high on all dimensions of emotional intelligence. Your EQ can improve over your lifetime. By deciding to analyze yourself, though, you can improve in any of the areas, within three to six months. Is it worth the effort? Do you want to be more in control at work or at home? Would you like to have a wider circle of influence? Would you like people around you to be more productive? Do you want to commit to and move ahead with your goals? As you already know, successful leaders are not simply managers who have been given a particular position in the organization. True leaders are those who can successfully influence, inspire, motivate and, most of all, produce results. Strengthening your emotional intelligence can help you make the shift from management to leader. We are nearing the end of 2009, and regardless of what 2009 had to offer you, it’s time to gear up for an even more exciting and effective 2010! Start the New Year by overhauling the way you address your team and its challenges by getting back to basics in your communication style. You will discover a refreshing difference in the success of your communication, which will have a ripple effect on the success of all your projects and relationships! Think clearly about what you want to convey. It sounds obvious, but using bullet points to review a meeting or present ideas clearly to someone is only helpful when they each include a subject, verb and object. If you are using bullet points as short-hand for your thought process, it is even more important, because your thoughts will likely change the next time you read those partial thoughts that you wrote down. Prepare for all of your meetings. 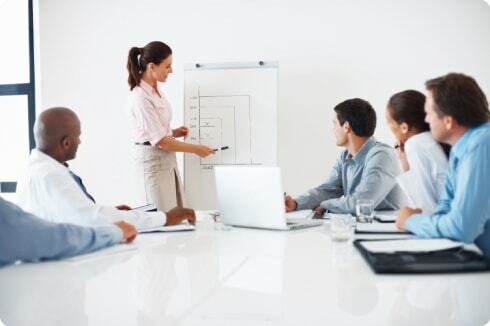 Do yourself and your team members a favor by preparing documents for meetings and distributing them in advance. Meetings often get a slow start or get off track, because documents have to be distributed and there is no familiarity with the content. Ask questions and then listen. Repeat. These days we are expected to have high-production days, every day. Each of us is in our own world, trying to give direction, solve issues and move to the next item on our list. As a leader, you will benefit from hearing others’ opinions, so after all these years of rushing to reach your current level, force yourself to take the time for engaging others in their opinions, and most of all, sitting back and listening to their response. Alternate points of view may give you a brand new take on a reoccurring issue. With all of the changes we have seen in 2009, 2010 is bound to be a year like we have never seen before. Let’s make it a particluarly effective one! Our interview this time is with sales expert, Scott Mcloughlin, founder and creator of the STORM method of selling. Scott brings more than 25 years of sales and management experience in fields as diverse as media, energy, training and development, management consulting, information technology services, enterprise software and Internet technology. His specialty is “turnaround situations, start-up companies and large Fortune 500 corporations. In general, we are seeing that everyone who has a sales force is beating the bushes a lot harder. The most successful sales forces are those who have a strong pipeline of opportunity—they manage and execute along those opportunities. Essentially, as a sales representative, you can’t just check in with your clients once in a while. Moreover, the essentials of successful selling are still the same; focusing on the right, high-payoff activities, and minimizing what the wrong or extraneous ones. It is as simple as this: If you spend more of your time doing the right things, and less doing the wrong, you will grow. The truth is that there is not a lot of magic, just hard work and directing those activities in the right place is critical. How have businesses changed their approach in this climate? What I counsel my clients is that they need to focus on getting the sales team to be confident that they are doing the right things and that they should stay the course. The worried ones are putting way too much emphasis on price. The worried ones who are making sales are selling at too low of a price point. I also think that businesses need to brace themselves for a higher turnover in sales force, who can’t handle the current climate. What is one of the most prevalent challenges that you are seeing in sales forces today? I frequently come across sales people who feel that they are beyond “prospecting.” The realit is that regardless of your industry, you always need to be in the business of getting new customers. Customers move on for many reasons; companies merge, the situations change. That’s a fact. Most sales people would rather get a route canal than prospect. Every sales person reaches a point in their career where they think they no longer have to do that. A lot of sales people have lost those skills. They don’t know how to go back there. Many people feel they are going to get customers by networking. Of course, networking has its place, but it only takes you so far. For example, at any given chamber event, there may be three financial services experts. Being one of them doesn’t help you close a sale or gain a new account. The reality is that they do have to do that. Even when I do storm meetings, I ask how much prospecting do they do? Here is that every week in a sales person’s schedule should include prospecting. Why don’t people like to think of themselves as salespeople? Everyone has been sold something they don’t like. And then they feel like it was a sleazy experience. If you are a professional business consultant, acquiring business is something you should be able to do and help your clients do, too. Thanks so much for your time, Scott. To learn more about Scott’s STORM Selling method, visit him at www.StormMethod.com. Sharon was recently promoted to branch manager at a well-respected, local insurance company. She has worked hard to reach this level; she knows the insurance business inside and out. However, as the manager of over 30 employees in her office, she has found that much of her position does not relate to what she knows about the industry. To her surprise, she spends most of her time handling conflict and morale issues. Today, she has to confront Jim, an angry subordinate. He is disgruntled, because a client who was originally his account has moved her business to Mike. Although she did so because she didn’t receive the service she wanted from Jim, he feels cheated, and is, of course, bitter about losing the commission on a long-standing customer account. The situation between the two agents is causing tension at the office, and it even seems like they are about to blow up at each other. Like many of us, Sharon has been putting off this confrontation, in hopes that it would go away. The result is that the tension is now much worse than it was two weeks ago. she has to handle the situation with savi, but her strengths do not lie in the realm of emotional intelligence. If you were Sharon, how would you handle this situation? Share your solution! Presentation Zen: Simple Ideas on Presentation Design and Delivery (New Riders, 2008), by Garr Reynolds, is a breath of fresh air for all of us who have been either attending or giving presentations for years. Garr Reynolds’ ideas challenge the conventional wisdom of making PowerPoint presentations that are chock full of text and basically offer an outline of the presenter’s notes. Gone is the era of the “read through” presentation – get ready for engaging and provocative image and text combinations, resulting in presentations that really stick. Presentation Zen takes the reader through the steps to conceiving and creating compelling presentations, and also gives numerous resources for images and ideas, complete with a guest piece by marketing guru, Seth Godin. This book is ushering in a new era. Be sure you are part of it, by picking up this title!